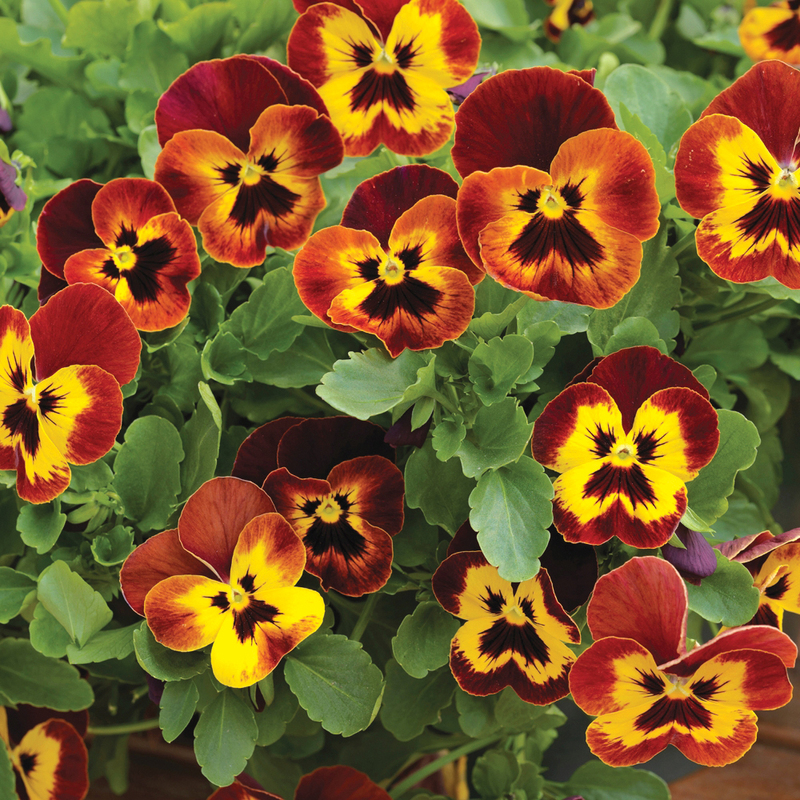 Pansies are such a friendly-faced flower! But until the 19th century most people considered them a weed. Today, pansies are a hybrid plant cultivated from those wildflowers in Europe and western Asia. Much of the collection and cultivation of pansies can be attributed to plantsmen and women in the UK and Europe more than 200 years ago. For example, Lady Mary Elizabeth Bennet, daughter of the Earl of Tankerville, and her gardener cross-bred a wide variety of Viola tricolor (common name “Heartsease”) and showcased their pansies to the horticultural world in 1813. Further experiments around the same time eventually grew the class to over 400 garden pansy varieties. Garden pansies (Viola x wittrockiana) are a mixture of several species, including Viola tricolor. Oftentimes the names “pansy”, “viola”, and “violet” are interchangeable. However modern pansies are classified by the American Violet Society as having large-flowered blooms with two slightly overlapping upper petals, two side petals, and a single bottom petal, with a slight beard in its center. They’re considered annual bedding plants, used for garden decoration during cooler planting seasons. Pansies come in a rainbow of colors: from crisp white to almost black, and most all colors in between. They are also a great addition to your spring or fall vegetable garden as they are edible and pair well with lettuces. They can also be candied and used to decorate sweets or other dishes. Most pansies fall into a few categories: Large (3 to 4 in. ), Medium (2 to 3 in. ), Multiflora (1 to 2 in. ), and a new category of Trailing pansy. Some modern large-flowered pansy series are Majestic Giant Mix, Delta, and Matrix. Medium-sized pansy series include Crown and Imperial. Multiflora pansy series like Maxim and Padparadja won All-America Selections awards in the early 1990s. See all-americaselections.org for all of the award-winning pansies. New on the scene for hanging baskets and ground cover are WonderFall and Cool Wave® pansies – the makers of Wave® petunias. These Trailing pansies spread over 2 feet wide and overwinter in fall gardens. Today’s garden pansy varieties can fill any sunny space – large or small, hanging overhead or growing underfoot – with soft fragrance and happy blooms. 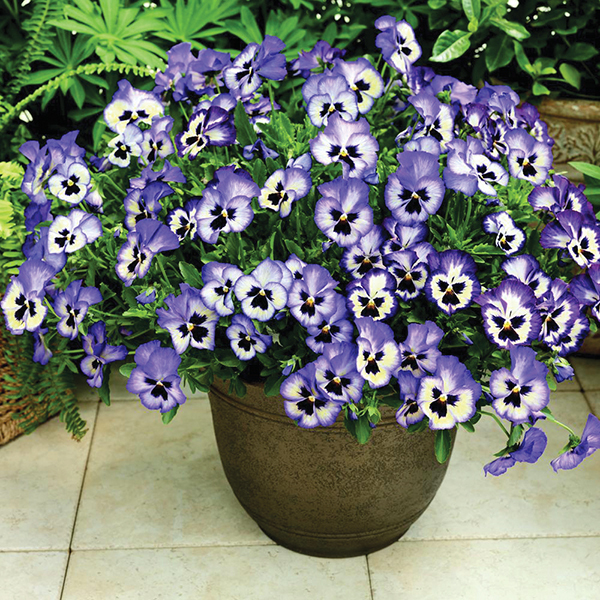 Space your pansies 6 to 10 inches apart in a well-drained and fertile soil location. The best location is an area that receives morning sun. Adding granular or time-release nutrition to the soil is encouraged, especially for trailing pansies as this increases their vigor and number of blooms. Offer plenty of water at planting and during their adjustment period to help establish roots and minimize stress. Mulching can help retain moisture and reduce any weeds that may compete with your plants. Pansies planted in the spring will enjoy the warm days and cool nights of the season. Most V. wittrockiana will begin to diminish or go out of flower as nighttime temperatures begin to rise in the summer. Yes, pansies are the perfect annual during late winter and early spring producing instantaneous color. Such a soothing solution to help gardeners transition into a new growing season. Article source and images by National Garden Bureau ngb.org. To view more pansy images, visit the online version of the March 2017 issue at KCGMAG.com.